July 4, 2014 Historical Happenings ~ The History Girl! Looking for something fun and educational to do with the family on Independence Day this year? Come to Ringwood Manor for the annual Declaration of Independence celebration! On Friday, July 4, 2013, Ringwood State Park will mark its 15th year holding the Independence Day event. 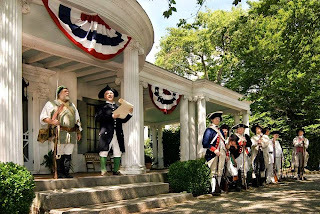 The event features a dramatic delivery and reading of the Declaration of Independence on the steps of the Manor’s porch along with colonial activities and demonstrations. Revolutionary War reenactors from New Jersey Militia- Heard’s Brigade, the 35th Royal Sussex Regiment, the Friends of Long Pond Ironworks, and individual reenactors help celebrate the 238th anniversary of American independence and bring the experience to life. The Declaration of Independence was formally adopted on July 4, 1776. News of its creation spread to the colonists in America through traditional public readings in large, open places such as town squares, churches, and taverns. The first public reading of the document was to a crowd in Philadelphia on July 8th, 1776, four days after its creation. A day later, it was first read aloud to Washington’s Continental troops in New York City. The celebration at Ringwood Manor attempts to recreate the same excitement first felt when colonists heard those famous words 236 years ago. The festivities will begin in front of Ringwood Manor at 1:00 pm, when colonial era toys and games will be available for children to play with. Young and old can sign their “John Hancock” on a copy of the Declaration using a traditional quill pen and ink. Colonial crafters, demonstrations, and displays will help to create an atmosphere of a town square in front of Ringwood Manor. The ceremony itself will begin at 2:00 pm with a short introduction about the history of the area and the Declaration of Independence. A lively debate among members of the crowd will break out, involving British soldiers, area Loyalists, and the supporters of the cause for independence, the colonial rebels. After the debate concludes, the local militia unit will form and muster up. Soon after, the Declaration will be delivered to the front steps of Ringwood Manor by a horse and rider. The document will then be read to the crowd at 2:30 pm. Visitors are encouraged to listen closely and cheer and jeer during the reading. Following the reading there will be a traditional flag raising. Again this year, the “Hopkinson” flag will be used for the event. Believed to be the first version of the new country’s flag, it was designed by and named after New Jersey’s own Francis Hopkinson. After the flag is raised, there will be a ceremonial musket volley and the bell at Ringwood Manor will be rung thirteen times to conclude the ceremony. The public is encouraged to stay after the ceremony as the celebration continues. Children are encouraged to join the Continental Army and learn military drills. 18th century baked goods and colonial items will be available to purchase from the Sugar Loaf Baking Company. Free watermelon slices are available to everyone who attends. All are welcome to join the fun! There is no charge for the Independence Day celebration. There is, however, a parking fee to enter Ringwood State Park of $5 for in-state residents, and $7 for out-of-state residents. The event will take place rain or shine. Ringwood Manor will be open to the public between 10:00 am and 1:30 pm only to allow for the event to proceed as scheduled. The entrance fee for Ringwood Manor is $3 for adults, $1 for children ages 6-12, and children 5 and under are free. Ringwood Manor is located at 1304 Sloatsburg Road, Ringwood, NJ. Independence Day at Ringwood Manor is sponsored by the North Jersey Highlands Historical Society and the Ringwood State Park staff. For more information, call 973-962-7031 ext. 0 or visit www.ringwoodmanor.org. Celebrate July 4th at Morven, the former home of Richard Stockton, a signer of the Declaration of Independence! This FREE family event will take place on the front lawn from 12:00 noon - 3:00 pm! The Riverside Bluegrass Band will be performing on the front porch and various activities including Stacy Flora Roth presenting, “Over Here Molly Pitcher”, celebrating the women of the American Revolution, a discussion with “George Washington” as he shares personal letters, an opportunity for children of all ages to “sign” the Declaration of Independence, games and MORE! Oink & Moo BBQ will also be on-site to provide refreshments! This event is SHINE only (due to the outdoor activities, it will be cancelled if there is prolonged rain). Morven Museum & Gardens is located at 55 Stockton Street, Princeton, NJ. For more information, call 609-924-8144 or visit www.morven.org. Celebrate Fourth of July at Revolutionary Times in Morristown this Friday. The festivities on the Morristown Green will begin at 11:00 am with patriotic music provided by the Morris Music Men and Wire Harp, along with audience warm-up activities led by National Park Service (NPS) ranger Eric Olsen. Following the Proclamation, the Declaration of Independence will be read with great passion by NPS ranger Tom Winslow, followed by the tolling of the bells and a musket salute. Free tours of the Presbyterian Church will be available after the reading. General George Washington visited the church in 1777 and the site boasts many connections to Morristown’s colonial past. This event will highlight the critical role that the Morristown area played in the Revolutionary War. A ribbon-cutting ceremony will be held at 2:00 pm at Fort Nonsense, part of the Morristown National Historical Park, which recently underwent a significant 2014 renovation to improve the overall visitor experience to the former fort and look-out. The rehabilitation of the site includes clean-up of the tree debris; new road guide and entrance sign which will aid visitors in finding the site, as well as the replacement of worn and damaged interpretive signs explaining the history of the fort and its strategic importance. In addition, new benches, picnic tables, and animal-proof trash cans have been installed for the use and comfort of visitors. This family-friendly event supports the "liberty" theme of New Jersey's 2014 celebration of its 350th Anniversary and is dedicated to raising awareness of the role that Morristown area played in the Revolutionary War. The festivities in downtown Morristown conclude at 3:00 pm. Parking is free in downtown Morristown on July 4th. For more information, call 973-539-2016 ext 210 or visit www.morristourism.org. Brings the kids to Tuckerton Seaport at 4:00 pm on July 4th for the Baby Parade. Dress to impress in red, white, and blue. Various children’s activities will be taking place from 4:00 - 9:00 pm. There will be a Video Game Trailer from 4:00 - 8:00 pm for FREE! Live music will be on stage from 5:00 - 9:00 pm. Make sure you view the fireworks from the Tuckerton Seaport Boardwalk! Food Vendors will be located on Main Street and in the parking lot of the Seaport. There will be a rain date of July 5, 2014 for fireworks ONLY! Enjoy a family-friendly day of fun free of charge! Tuckerton Seaport & Baymen's Museum is located at 120 West Main Street, Tuckerton, NJ. For more information, call 609-296-8868 or visit www.tuckertonseaport.org. Stop in Freehold Borough on July 4th as volunteers gather on the steps of Borough Hall at 9:00 am for the annual reading of the Declaration of Independence. Thomas Jefferson (portrayed by Mayor J. Nolan Higgins) will read the first portion of the Declaration, followed by members of the audience who will each read a few words. The names of the signers of the Declaration from each of the original 13 states will be read aloud at the end of the reading, and the fire bell next door at the Fire House will toll fifty times to commemorate each State in the Union; the flag will be raised, and the Pledge of Allegiance will be recited. The brief ceremony will conclude with a stirring rendition of “Battle Hymn of the Republic”. Everyone, young and old, is invited to participate in reading the Declaration. Copies of the document will be distributed at 8:45 a.m. to all those who would like to take part. Freehold Borough Hall is located at 51 West Main Street, Freehold, NJ. In the event of inclement weather, the event will be held indoors at the firehouse, 49 West Main Street. For more information, visit www.freeholdboro.org. Independence Day was a festive time in the 1890s at Longstreet Farm. Patriotism was celebrated with music, games and good picnic food. Join the staff at Longstreet Farm on July 4th as they celebrate the holiday with games and contests from 12:00 noon - 3:00 pm. Historic Longstreet Farm is located at 44 Longstreet Road, Holmdel, NJ. For more information, call 732-946-3758 or visit www.monmouthcountyparks.com. In 1776, the third reading of the Declaration of Independence took place in New Brunswick, New Jersey. Come celebrate the 4th of July with a reenactment of that historic event at historic Christ Church, 5 Paterson Street, New Brunswick, NJ. Learn about the history behind the reading of the Declaration in New Brunswick, tour the historic Christ Church Cemetery with graves marking Revolutionary War heroes, sing patriotic songs from the era, and hear unique American music performed on a traditional pipe organ. The event begins at 11:00 am. Free admission and free refreshments. Free parking will be available in the Church Street or Wolfson parking decks. For more information, visit www.christchurchnewbrunswick.org. On Friday from 1:00 - 4:00 pm, celebrate Independence Day in the 1776 setting of Historic Walnford’s main house. They will have the quill pens sharpened and the inkwells filled for you to scribe your own declaration of independence or bill of rights, as you reflect on the words of our founding citizens. While there, tour the historic mill and outbuildings. This event is FREE. Historic Walnford is located at 62 Walnford Road, Upper Freehold, NJ. For more information, call 609-259-6275 or visit www.monmouthcountyparks.com. 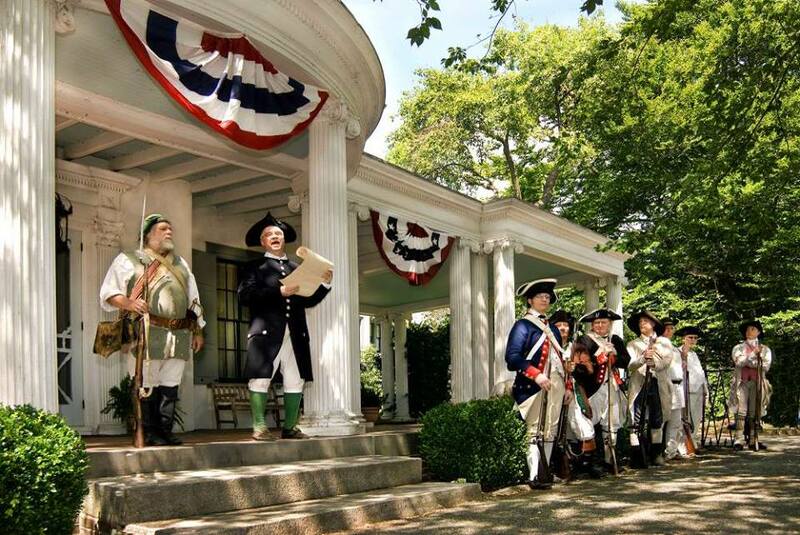 On July 4th, before Haddonfield's annual parade on Kings Highway, an interpreter will read the Declaration of Independence at 9:00 am on the steps of the Indian King Tavern. At 9:30 am watch a demonstration of musketry. At 10:00 am the parade through Haddonfield begins! An open house will follow the parade until 3:00 pm. Revolutionary War reenactors from the Second Pennsylvania Regiment will be encamped at the Indian King hanging out to celebrate, so be sure to join them! The Indian King Tavern is located at 233 Kings Highway East, Haddonfield, NJ. For more information, visit www.indiankingfriends.org. In between viewing spectacular fireworks and attending family barbecues on this upcoming 4th of July weekend, be sure to take part in another summertime American tradition - enjoying ice cream. Ice cream, a magician, beekeeper, flea circus, patent medicine show, a balloon lady, a DJ and music, a cookie bake off, and tours of the historic birthplace are all part of the fun at the social, to be held on Friday, July 4 from 1:00 - 4:00 pm. Take a stroll through history with free tours of the historic birthplace museum and peak into the past with the traveling trunks. Enjoy entertainment from a strolling magician, balloons for kids and of course free ice cream for everyone! Family entertainment includes the Phydeau flea circus, an old time patent medicine show or have tin type photographs made. Children may dress up in Victorian costumes, enjoy Cleveland era games such as marbles, and potato sack races. Food services are by Cloverleaf Tavern, and old fashioned lemonade and popcorn are also available. The Grover Cleveland Birthplace is located at 207 Bloomfield Avenue, Caldwell, NJ. While there are no admission charges and many events are free, donations are accepted. For more information, call 973-226-0001 or visit www.presidentcleveland.org. In honor of the 4th of July holiday, a reading of the Declaration of Independence will be held on Friday at 10:00 am at the Henry Doremus House, 490 Main Road (aka Rt 202), Montville, NJ. Attendees may also tour the circa 1760 Henry Doremus House after the ceremony with tours led by the Montville Twp Historical Society. Montville Twp (as then part of Pequannock Twp) and the Henry Doremus House have roots in the American Revolution as the farmhouse was an eye witnesses to all the military traffic in the area during the Revolutionary War. General George Washington occupied the house from June 25 through 27, 1780 during the American Revolutionary War after retreating from the Battle of Springfield. He was accompanied by 40 aides and 2,000 Continental soldiers. Parking will be available in the Sea Breeze parking lot across the street from the Henry Doremus House. On Friday, celebrate Independence Day at Princeton Battlefield. The battle on this site on January 3, 1777 is considered to be the fiercest fight during the American Revolution. General George Washington led his troops to this otherwise peaceful winter field and defeated a force of British Regulars, giving Washington his first victory against the British Regulars on the battlefield. Between 11:00 am and 3:00 pm, there will be period games for children of all ages. A talk on the Battle of Princeton will be given at 12:00 noon and a reading of the Declaration of Independence will occur at 1:00 p.m. Admission is free. Princeton Battlefield is located at 500 Mercer Road, Princeton, NJ. For more information, call 609-921-0074 or visit www.theprincetonbattlefieldsociety.com. On Friday, celebrate Independence Day at Washington Crossing State Park in Titusville. Susan McLellan Plaisted will prepare ice creams using recipes and techniques of the late 18th century (free samples). At 2:00 pm, a reading of the Declaration of Independence will take place at the Visitor Center/Museum, followed by a musket firing demonstration. Admission is free but parking fees will be in effect - $5 for New Jersey residents and $7 for out-of-state residents. Washington Crossing State Park is located at 355 Washington Crossing-Pennington Road, Titusville, NJ. For more information, call 609-737-9303.